One-time tournament regular Travell Thomas has been sentenced to 100 months in prison in connection with a major New York-based debt-collection enterprise that fraudulent preyed on thousands of victims. Thomas, one of the owners of several interrelated businesses involved in the illegal debt-collection practices, heard his sentence on Thursday in a Manhattan federal courtroom. Thomas, 38, was the CEO of 4 Star Resolution, the Buffalo-based collection firm that authorities asserted wrested tens of millions of dollars from debtors through threatening and illegal means. Thomas was the last of several defendants in the case to accept a plea deal, which spared him the possibility of a much longer sentence of up to 40 years. Thomas could still have faced 15 and a half years in prison, but received the lessened sentence instead from the case’s presiding judge, Katherine Polk Failla. Thomas was also ordered to pay $31 million in restitution to his victims, though it’s unlikely he’ll ever repay that total amount. Thomas and his employees, according to court documents, often “juiced” the accounts of their frightened victims, inflating the actual amountof money they owed. On the poker front, Thomas was a frequent participant in mid-level poker tournaments in New England and down the East Coast, largely paid for by some of the funds illicitly obtained from the threats made by the businesses owned by Thomas and his partners. Local reports describing his sentencing described Thomas as “one of the nation’s top poker players,” though that’s healthy on the hyperbole. To date (and maybe forever), Thomas has logged just over half a million in career tourney earnings,a figure that’s never cracked the top 1,000 players in such career earnings. 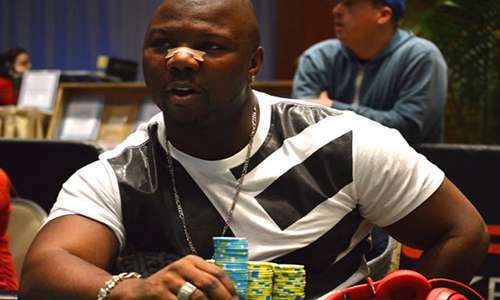 Thomas’s claims to fame in the poker world are his winning two WSOP Circuit Series rings. The first of those came in an Atlantic City WSOPC prelim in 2011, and the second in a similar WSOPC prelim in Las Vegas in 2013. Before he pled guilty last November, Thomas and his attorneys previously alleged that Bharara’s Sothern District of New York USAO had engaged in racial discrimination by cracking down on the debt-collection businesses of Thomas and his partners. However, Thomas later dropped that threat, likely in the face of the significant evidence of guilt already collected by Bharara’s investigators. The case involving Thomas was, unfortunately, just the latest black eye for Buffalo’s prominent but legal-edge-skirting debt collection industry. Similar high-pressure tactics and illegal schemes have been exposed in other Buffalo debt-collection crackdown cases over the last decade.